The American Health Council is proud to honor Larry Hartzell, MD as “America’s Best Doctor” for his outstanding humanitarian efforts to aid children suffering from cleft lip and palate. As the director of the Cleft Lip and Palate Program at Arkansas Children’s Hospital in Little Rock, AR, Dr. Hartzell performs surgical procedures that improve his patients’ quality of life. While he has held his current role for nearly seven years, he has spent the last 11 years in the healthcare industry expanding his skills and knowledge in pediatric ear, nose and throat procedures, pediatric cleft lip and palate, program management, clinical research and leadership. Dr. Hartzell decided to pursue a career in Otolaryngology (ENT) after his niece was born with a cleft lip during his medical school education. His interest in the functions of the human body, combined with his passion to work with children and a yearning to work in a hospital environment, led him to pursue a career in the medical field. After enrolling at Brigham Young University in Utah to study Zoology with a human biology interest, Dr. Hartzell halted his academic pursuit for 2 years to partake in a church mission to Barranquilla, Colombia. He quickly picked up the native language, Spanish, which he is able to use to the benefit of his patients today. After graduating from Brigham Young University, he enrolled at the University of Arizona College of Medicine and earned a medical degree in 2005 and in the process was inducted into the Alpha Omega Alpha (AOA) Medical Honor Society. Dr. Hartzell continued his education and completed a residency in Otolaryngology at the University of Arkansas for Medical Sciences and later completed a 2 year pediatric otolaryngology fellowship at Arkansas Children’s Hospital. His career quickly blossomed at Arkansas Children’s Hospital after completing his fellowship. Due to his extensive knowledge and skills, Dr. Hartzell was named the director of the Cleft Lip and Palate Program in 2012 and has retained that title since. He is responsible for training fellows, residents and medical students at the hospital, as well as directing and overseeing the cleft team. He also participates in other multidisciplinary clinics to promote the comprehensive management of complex patients. Additionally, he conducts research on cleft lip and palate, vascular anomalies and other disorders in the head and neck area. He is certified by the American Board of Otolaryngology, Head & Neck Surgery, and has served as a national and international speaker at multiple medical events. To ensure that he remains connected with evolving cleft lip and palette-related procedures, Dr. Hartzell is a member of several associations, including the American Academy of Pediatrics, the American Academy of Otolaryngology, Head & Neck Surgery, the American Cleft Palette-Craniofacial Association and the American Academy of Facial Plastic & Reconstructive Surgery. His charitable demeanor shines through his professional and personal interests as he has traveled to China, Guatemala, Ecuador and Egypt to perform cleft lip and palette operations. Dr. Hartzell also volunteers with Global Smile Foundation for medical mission trips and helps coordinate Camp Laughter to benefit the local cleft and craniofacial patients in Arkansas. He also serves in various positions within his church, the Church of Jesus Christ of Latter Day Saints, including Cub Scouts and Boy Scouts as well involvement in his community including service as an assistant soccer coach in the Maumelle Soccer Club. A devoted family man, Dr. Hartzell enjoys spending time with his wife and three children. He enjoys hiking, camping, canoeing, snowboarding, reading, watching movies and diving into the Star Wars fandom. With a successful career at hand, Dr. Hartzell also serves as a tenured Associate Professor at the University of Arkansas for Medical Sciences, and plans to work toward a promotion to professor. 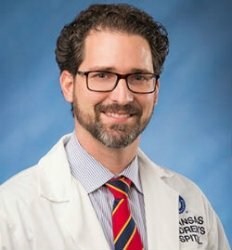 He also looks forward to remaining the director of the cleft team and expand research within the team in addition to providing state of the art and compassionate care to the cleft patients in Arkansas and surrounding areas. Arkansas Children’s Hospital (ACH) is among the largest pediatric hospitals in the United States, and serves children from birth to age 21. ACH is affiliated with the University of Arkansas for Medical Sciences and is a teaching hospital with the UAMS College of Medicine’s Department of Pediatrics. ACH staff consists of more than 505 physicians, 200 residents and 4,400 support staff.